Oxford Properties Group have announced that a 600,000 square foot office tower will proceed on land between 2nd Avenue and 3rd Avenue S.W. along 4th Street. Completion of Eau Claire Tower is expected in 2016. 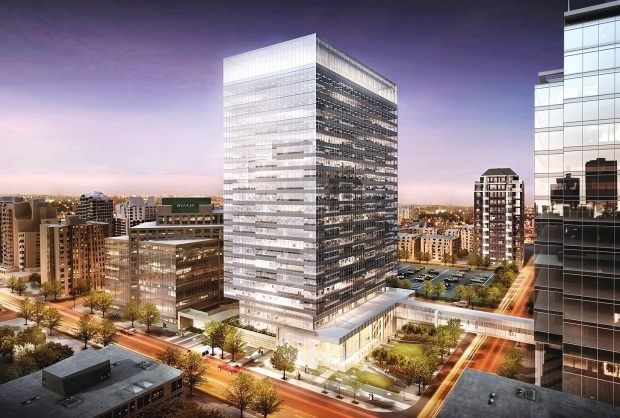 MEG Energy Corp., one of Calgary’s fastest-growing thermal oilsands producers, and currently an Oxford Tenant at Centennial Place have committed to lease eleven floors in the new project. MEG’s office space will grow from about 200,000 square feet to approximately 500,000 square feet and they will access their new offices across a planned plus 15 walkway from Centennial Place to Eau Claire Tower. The building, designed by B+H Architects, is to be built to Class AAA, LEED Gold standards. It will feature efficient floor plates, large windows and a fitness centre.